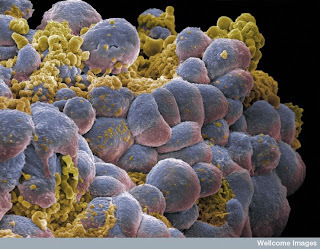 programmed cell death (apoptosis) in yellow. Nowadays there are quite a few compounds in clinical trials to assay their potential as breast cancer treatments. Some of them are the so called “PARP inhibitors”. These inhibitors work very well in tumours that have a deficiency in DNA repair because PARP proteins are involved in that process. However, a group of researchers working on a different type of breast cancer without any problem in DNA repair has discovered that, unexpectedly, PARP inhibitors can kill the cells of this other type of breast cancer as well. Breast cancer is not just “one” cancer. It can be the result of different mutations; therefore there will be different types of breast cancer. One of them is called “BRCA deficient tumour”. This tumour has a defect in BRCA proteins. These proteins are part of one of the DNA repair mechanisms, the Homologous Recombination (HR). Cancer cells with a deficient HR cannot repair their DNA properly leading to a higher genomic instability. This instability is an important survival factor for the tumour and DNA repair mechanisms are good targets for antitumor therapy. One DNA repair mechanism has a step that involves PARP proteins. When the DNA strands break these proteins bind to them and are very important for their resealing. There are two different types of breaks: the single strand break (when only one strand breaks –SSB-), and the double strand break (when both strands of DNA break –DSB-). If a SSB happens PARP proteins bind to it and recruit other proteins to ensure the break is fixed. If that SSB is not fixed and the DNA starts to make a copy of itself, when the copying machinery gets to the SSB it will be transformed into a DSB. To fix this DSB the BRCA proteins are required. So, for a happy, non-cancer cell, all the DNA repair mechanisms should work properly and coordinated. If this doesn’t happen we need to force the cell to die. Fig. 1 Dual cytotoxic mechanisms of PARP inhibitors. 1, catalytic inhibition (upper pathway) interferes with the repair of SSBs, leading to DNA replication damage that requires HR repair. 2, trapping of PARP–DNA complexes also leads to DNA replication damage but uses additional repair pathways. Credit: Murai et al., 2012. PARP inhibitors are small molecules that bind to PARP proteins not allowing them to work, as well as trapping them to the DNA strands. In a normal cell this would lead to SSBs and DSBs that will be corrected by BRCA and other proteins involved in different DNA repair mechanisms (Figure 1). But if the cell has a defect in BRCA proteins these DSBs won’t be fixed and the cell will be forced to die because of the persistent DSBs lethality. That’s the reason why PARP inhibitors are being widely tested as antitumor drugs to treat the BRCA deficient breast and ovarian cancers. In addition, PARP inhibitors have been studied in combination with DNA damaging agents due to their ability to enhance the toxicity of these agents. Nowadays the use of PARP inhibitors as part of a therapeutic combination is widely studied, but mostly in the context of DNA damage and repair. On the other hand, a third of all breast cancers have an increased amount of another protein called HER2 and this makes them very aggressive. HER2 belongs to a family of proteins that are involved in cellular growth, differentiation and survival. Actually HER2 activates the NF-KB signalling pathway which enhances cell proliferation, invasion, and resistance to therapies. In addition, activation of NF-KB depends on PARP. Anti-HER2 therapies are working quite well and have improved patient outcome but a significant number of patients either do not respond or quickly relapse and exhibit resistance to therapy. A surprising discovery by some researchers at the University of Alabama has opened a very promising field of study for the treatment of the HER2 positive breast cancers that are resistant to anti-HER2 therapy. These researchers previously published that cetuximab, a HER1 inhibitor produced a DNA repair defect in head and neck cancer cells. Therefore they tried to see if a HER1/HER2 inhibitor (lapatinib) would generate a similar DNA repair defect and sensitise HER2+ cancer cells to PARP inhibitors (such as ABT-888 –veliparib–). When they treated the HER2+ breast cancer cell line BT-474 with the anti-HER2 drug lapatinib and the PARP inhibitor ABT-888 as well as with ABT-888 alone as a control, they saw that the ABT-888 on its own was able to reduce the viability of the cells (Figure 2A). And this happened in different HER2+ cell lines, but not in those cell lines without an increased amount of HER2 (HER2-) (Figure 2B). Fig.2 A) ABT-888 with or without lapatinib reduces the colony-forming ability of HER2-overexpressing BT-474 human breast cancer cells. B) Breast cancer cell lines exposed to various doses of ABT-888 or vehicle control and colony formation capacity assayed. As expected, the HER2 negative MCF7 and T47D cell lines failed to exhibit cytotoxicity to the PARP inhibitor ABT-888. Credit Nowsheen et al., 2012. The obvious explanation for this observation is that the HER2+ cells had a DNA repair defect or that the ABT-888 inhibitor produced that defect. However none of these hypotheses was true. Another explanation is that the effect of ABT-888 could be produced through HER2 itself. And this was the case, because when the researchers manipulated the HER2- cells to have an increased amount of HER2 (becoming HER2+) these cells became sensitive to ABT-888 and died. As I said before, HER2 activates the NF-KB pathway and PARP1 is required for NF-KB activity. When researchers treated HER2+ cells with ABT-888 they saw a reduction in NF-KB activity. This doesn’t happen in HER2- cells, but when HER2 is introduced into these cells NF-KB activity decreases after treatment with ABT-888 as well. This strongly points to a mechanism in which HER2 mediated toxicity of ABT-888 works through NF-KB. In addition, increased levels of a protein that inhibits NF-KB mimic the ABT-888 toxicity. (MCF7 NEO). Credit: Nowsheen et al., 2012. All these assays were done in vitro. However, the researchers did some in vivo experiments as well. They transplanted breast cancer cells with (MCF7 HER2) or without (MCF7 NEO) an increased amount of HER2 into mice and treated those xenografts (transplants of cells) with ABT-888 or a control vehicle (Figure 3). The increased amount of HER2 itself produced increased tumour aggressiveness as seen by the faster growth of MCF7 HER2 tumours in mice compared with MCF7 NEO. Moreover, administration of ABT-888 delayed tumour growth in MCF7 HER2 xenografts but not in MCF7 NEO ones. This study shows preliminary data about the effect of PARP inhibitors in HER2+ breast cancers and opens a very interesting possibility to further study the role of PARP inhibitors in the treatment of other type of cancers without a DNA repair defect. Published originally in Mapping Ignorance.